A cold, yet trenchant statement. As in many early societies, slavery in ancient Rome was a mixture of debt-slavery, slavery as a punishment for crime, born slavery and by far the enslavement of prisoners of war especially during the Republican period. An estimated 30 to 40% of the population of Italy were slaves in the 1st century BC, an estimated two to three million people. For the Empire as a whole, slaves numbered just under five million, representing 8-10% of the total population of a 50-60 million. Roman slavery was not based on race; slaves originated from all parts of Europe and the Mediterranean, including Gaul, Hispania, Germany, Britannia, the Balkans and Greece. The Twelve Tables, Rome’s oldest legal code, promulgated in 449 BC, makes brief references to slavery, indicating that the institution was of long standing. Slaves were considered property under Roman law and had no legal personhood. Unlike Roman citizens, they could be subjected to corporal punishment, sexual exploitation (prostitutes were often slaves), torture, and summary execution. The testimony of a slave could not be accepted in a court of law unless the slave was tortured – a practice based on the belief that slaves in a position to be privy to their masters’ affairs would be too virtuously loyal to reveal damaging evidence unless coerced. Over time, however, slaves gained increased legal protection. Vernae were slaves born within a household (familia) or on a family farm. There was a stronger social obligation to care for vernae; many would have been the children of free males of the household. Often, but not always, they were freed on the master’s death. Roman slaves could hold property which, although it technically belonged to their masters, they were allowed to use as if it was their own. Skilled or educated slaves were allowed to earn their own money, possibly saving enough to buy their freedom. Otherwise, slaves could be freed in their master’s will, or for services rendered. A notable example of a high-status slave was Cicero’s secretary, Tiro, who was freed before his master’s death. Tiro was successful enough to retire on his own country estate, where he died at the age of 99. Slaves were granted more rights as the empire grew; Claudius announced that if a slave was abandoned by his master, he became free. Nero granted slaves the right to complain against their masters in a court. And under Antoninus Pius, a master who killed a slave without just cause could be tried for homicide. It became common throughout the mid to late 2nd century AD to allow slaves to make complaints to officials about cruel or unfair treatment by their owners. 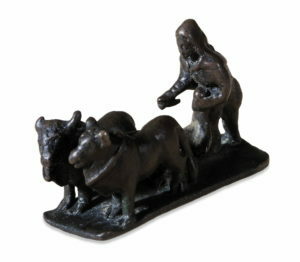 Slaves worked in roughly five categories: household/domestic, imperial/public, urban crafts and services, agriculture, and mining. Household (familia): Epitaphs record at least fifty different jobs a household slave might perform including barber, butler, cook, hairdresser, handmaid (ancilla), wet nurse or nursery attendant, teacher, secretary, seamstress, accountant or physician. A large elite household might be supported by a staff of hundreds. Although inferior to those of the free persons they served, the living conditions of slaves attached to an urban household were often superior to those of many free urban poor in Rome. Indoor household slaves likely enjoyed the highest standard of living among Roman slaves, next to publicly owned slaves. Imperial slaves were attached to the emperor’s household, the familia Caesaris. 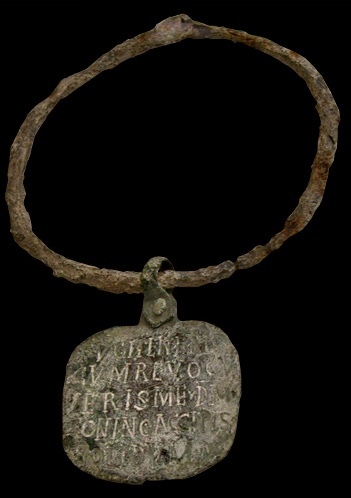 As in any Roman household, the senior male, the pater familias, held full rights over his slaves as over his family, and women slaves were frequently used for sexual services as a matter of course. In urban workplaces, the occupations of slaves included fullers, engravers, shoemakers, bakers, seamstresses, mule drivers, and waitresses/prostitutes. Farm slaves (familia rustica) probably lived in a healthier environment, but their work was heavy and manual. The workforce of a farm would have been mostly slave, managed by a vilicus, often a slave himself. Tens of thousands of slaves condemned to work in the mines or quarries (damnati in metallum), worked in notoriously brutal conditions; they were convicts who as a consequence lost their freedom as citizens (libertas), forfeited their property (bona) to the state, and became servi poenae, slaves by legal sanction. Their legal status was different from that of other slaves; they could not buy their freedom, be sold, or be set free. They were expected to live and die in the mines. In the Late Republic, around half the gladiators who fought in Roman arenas were slaves, the remainder free volunteers. Successful slave gladiators were occasionally rewarded with freedom. However, trained gladiators with access to weapons were potentially the most dangerous slaves as demonstrated by Spartacus, who led the great slave rebellion of 73-71 BC. 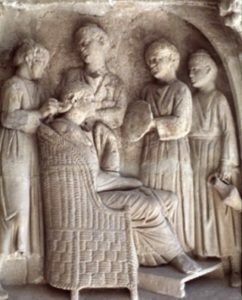 A servus publicus was a slave owned not by a private individual, but by the Roman people and worked in temples and other public buildings as servants to the College of Pontiffs, magistrates, and other officials. Some well-qualified public slaves carried out skilled office work such as accounting and secretarial services and were permitted to earn money for their personal use. During the Republic, a public slave could be freed by a magistrate’s declaration, with the prior authorisation of the senate; in the Imperial era, manumission would be granted by the emperor. Romans were preoccupied, if not paranoid, by the thought of slave revolt which had more than once seriously threatened the republic; in 135-132 BCE (the First Servile War), in 104-100 BCE (the Second Servile War), and in 73-71 BCE (the Third Servile War). Rome forbade harbouring fugitive slaves; professional slave-catchers were hired to hunt down runaways. Owners or hired slave-catchers would post advertisements with precise descriptions of escaped slaves, and offered rewards. If caught, fugitives could be whipped, burnt with iron, or killed. Those who lived were branded on the forehead with the letters FUG, for fugitivus and sometimes had a metal collar with the owner’s name riveted around the neck. Masters could manumit, or free, slaves and in many cases such freedmen went on to rise to positions of power and accumulate great wealth. Manumissio, which literally means “sending out from the hand”, could be a public ceremony, performed before a public official, usually a judge. The owner touched the slave on the head with a staff and he was free to go. Simpler methods were sometimes used, with the owner proclaiming a slave’s freedom in front of friends and family, or just a simple invitation to recline with the family at dinner, a sign of possessing free citizen status. Slaves were freed for a variety of reasons; for a particularly good deed toward the slave’s owner, or out of friendship or respect. Sometimes, a slave had earned and saved enough money could buy his freedom and the freedom of a fellow slave, frequently a spouse. Slaves could also freed by a provision in an owner’s will at his death. Augustus restricted such manumissions to a maximum of a hundred slaves, and proportionately fewer in a small household. Educated and skilled slaves were regularly freed and the practice became so common that Augustus decreed that no Roman slave could be freed under the age of 30. Rome differed from Greek city-states in allowing freed slaves to become Roman citizens. After manumission, a former slave enjoyed political and public freedom (libertas), including the right to vote, though he could not hold elected public office, state priesthoods, nor attain senatorial rank. A freed slave who had acquired libertas became a libertus (feminine liberta) in relation to his former master, who then became his patron (patronus). 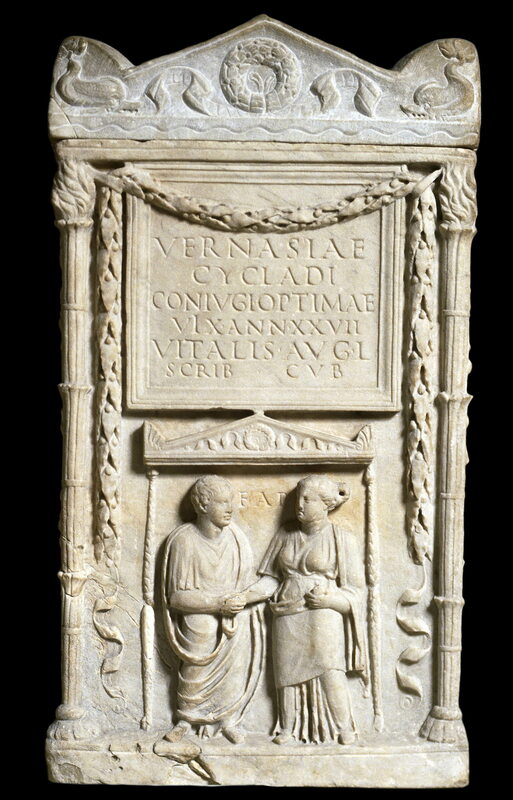 Marble cinerary urn provided by Vitalis, a former slave of the Emperor and Scribe of the Bedchamber, for his wife Vernasia Cyclas,. On the last line, AUG.L denotes he was a former imperial slave (British Museum). Children born to former slaves enjoyed the full privileges of Roman citizenship, for example, the Latin poet Horace was the son of a freedman, and served as an officer in the army of Marcus Junius Brutus. Freedmen of the Imperial families often filled key positions in the Roman government bureaucracy. Some rose to positions of great influence, such as Narcissus, a former slave of the Emperor Claudius. Other freedmen became wealthy. The brothers who owned House of the Vettii, one of the biggest and most magnificent houses in Pompeii, are thought to have been freedmen. A freedman is recorded with having designed the amphitheatre in Pompeii. But a freedman who became rich and influential might still be looked down on by the traditional aristocracy as a vulgar nouveau riche as shown by Trimalchio, a caricature of such a freedman in the Satyricon. For an excellent historical fiction around household slaves in the first century AD you can do no better than Lindsey Davis’s Enemies at Home; a mystery but an impeccably researched one which is clever and poignant at the same time. When Apulius led the Twelve Families out of Rome in AD 395, he asked for volunteers only. Most of his household accompanied him as freed men and women, the remainder, he manumitted before he left. In practical terms, Rome at the end of the fourth century was inherently unstable and being freed urban poor was a life-endangering status so most went with Apulius. From its earliest days, slavery did not exist in Roma Nova, although the structure of household and family units was to endure. 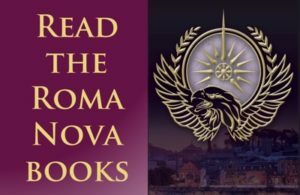 Everybody worked, regardless of status; Roma Nova started as a subsistence society in harsh times.The aim at that time was to stay alive. 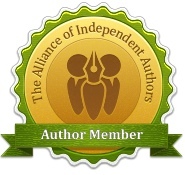 Alison Morton is the author of Roma Nova thrillers – INCEPTIO, PERFIDITAS, SUCCESSIO, AURELIA, INSURRECTIO and RETALIO. CARINA, a novella, is available for download now. 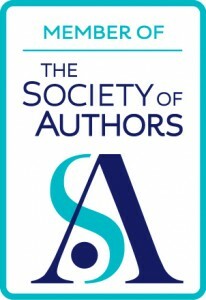 Audiobooks are available for the first four of the series. Such a fascinating post. My compliments! Thank you! Thank you, Pamela. It was fascinating to pull this together and to see that it was not quite as straightforward as we might think!